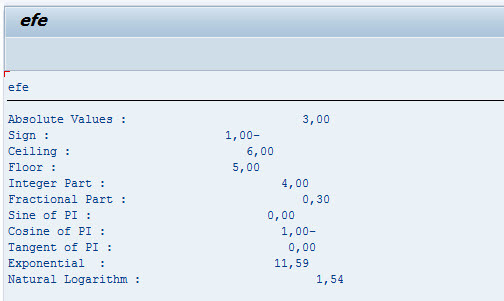 ABAP Provides many built-in math functions, so you can develop advanced mathematic calculation using ABAP Math functions. These are ABAP Math functions. abs : calculate absolute value. sign : Determines the sign of the provided values. ceil : Rounding up the provided values. floor : Rounding down the provided values. trunc : Return integer part of the argument. frac : Return the fractional part of the argument. cos, sin, tan : Calculate trigonometric functions. cosh, sinh, tanh : Calculate the hyperbolic trigonometric function. exp : Implements the exponential function. log : Implement the natural logarithm function. log10 : Calculate logarithm using base 10.
sqrt : Calculate the squares root of number. Example code below show how to call the math function listed before and including result of program. REPORT ztest. DATA : lv_result TYPE p DECIMALS 2. CONSTANTS : lv_pi TYPE f VALUE '3.14159265'. START-OF-SELECTION. lv_result = abs( -3 ). write : / 'Absolute Values : ', lv_result. lv_result = sign( -15 ). write : / 'Sign : ', lv_result. lv_result = ceil( '5.7' ). write : / 'Ceiling : ', lv_result. lv_result = floor( '5.7' ). write : / 'Floor : ', lv_result. lv_result = trunc( '4.3' ). write : / 'Integer Part : ', lv_result. lv_result = frac( '4.3' ). write : / 'Fractional Part : ', lv_result. lv_result = sin( lv_pi ). write : / 'Sine of PI : ', lv_result. lv_result = cos( lv_pi ). write : / 'Cosine of PI : ', lv_result. lv_result = tan( lv_pi ). write : / 'Tangent of PI : ', lv_result. lv_result = exp( '2.4504' ). write : / 'Exponential : ', lv_result. lv_result = log( '4.678' ). write : / 'Natural Logarithm : ', lv_result. DATA : lv_result TYPE p DECIMALS 2. CONSTANTS : lv_pi TYPE f VALUE '3.14159265'. lv_result = abs( -3 ). write : / 'Absolute Values : ', lv_result. lv_result = sign( -15 ). write : / 'Sign : ', lv_result. lv_result = ceil( '5.7' ). write : / 'Ceiling : ', lv_result. lv_result = floor( '5.7' ). write : / 'Floor : ', lv_result. lv_result = trunc( '4.3' ). write : / 'Integer Part : ', lv_result. lv_result = frac( '4.3' ). write : / 'Fractional Part : ', lv_result. lv_result = sin( lv_pi ). write : / 'Sine of PI : ', lv_result. lv_result = cos( lv_pi ). write : / 'Cosine of PI : ', lv_result. lv_result = tan( lv_pi ). write : / 'Tangent of PI : ', lv_result. lv_result = exp( '2.4504' ). write : / 'Exponential : ', lv_result. lv_result = log( '4.678' ). write : / 'Natural Logarithm : ', lv_result.